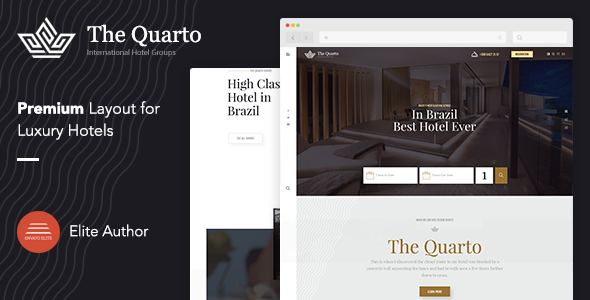 The Quarto is the modern, luxury WordPress theme for premium hotel and suites. Amazing and unique design make The Quarto more attractive and premium. You can use any plugins for travel and booking or you can direct your customers to hotel any booking websites. There is no reservation system integrated into the theme. Based on our previous hotel theme experience we have seen that each customer uses a different system and in this theme we have left the reservation process and pages to your own forms and elements. If you need help with integrating reservation systems, you can ask us, there are many methods and plugins we know. Before choosing a hotel reservation system, you may need to check which services are strong such as Airbnb, booking.com etc. When you consider the very powerful infrastructures, millions of visitors and publicity facilities that these services use, you can see that using a reservation system on your site is not very useful. You can easily do this with button-like items in the header area of the theme. You can use WooCommerce and WP Hotel Booking plugins to control your local rezervations, you are totally in control! You can use this theme for Travel, Hotel, Hostel, Motel, SPA, Holiday Village and other categories. Thanks to the advanced theme options, you can control all colors and fonts and build your desired typography and color schemes. We add hundreds of features so you don’t need to use any additional plugins in almost all of our themes and also, you can build a onepage page style on a multipage website.